YOUNG trap shooters in the State’s North-West will soon be able to test themselves on Olympic-class targets following the announcement of $10,120 in State Government funding for Moree Gun Club. Club treasurer Terry Haynes said the funds will be used to install a Canterbury Crusader Trap and steel trap house at the club. The trap throws targets at the speed and trajectory of Olympic-class units, allowing the region’s young shotgun shooters to be trained to a much higher level than is now possible. The steel house improves safety. “Hopefully this means that some day, we’ll have a young shooter from the North-West competing in the Olympics,” Mr Haynes said. 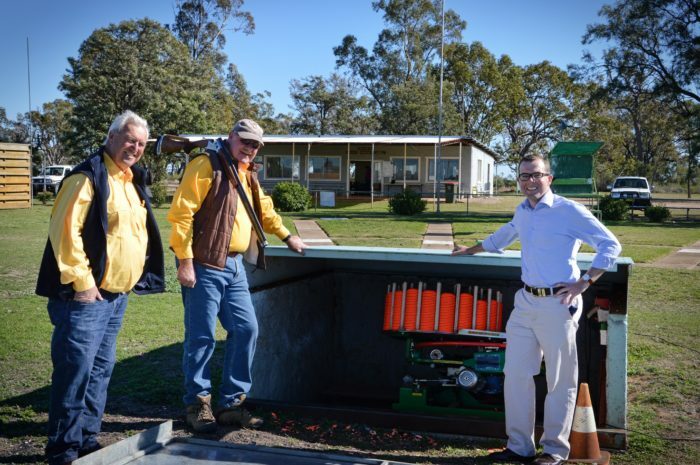 Northern Tablelands MP Adam Marshall congratulated the Club on its successful application to the State’s Safe Shooting Program during a recent visit to the club’s range. “It is a great pleasure to assist local clubs by providing the funds to increase the availability, standard and quality of sport facilities in the region,” Mr Marshall said. “Clay target shooting is a very popular sport in our region and is increasingly becoming a sport for all members of the family. Gun clubs in the electorate shared $23,102 in Safe Shooting grants, which support safe, responsible use of firearms.